This is Sony’s smart watch, which has been around for a while now. It’s designed for use with your Android phone, and has always included an SDK that allows app developers to interact with it. But now Sony is taking it one big step further. They’ve published everything you need to know to hack your own firmware for the SmartWatch. The navigation scheme for that articles includes five menu items at the bottom which you’ll want to dig through. The most interesting to us was the one labeled “SmartWatch hacker guide”. It lays bare the hardware used in the watch and how it’s peripheral component connect to each other. This starts with the STM32 (ARM) microcontroller that drives the watch. It goes on to document how the screen is addressed (SPI1) including the pin to turn it on and off. The same goes for the Bluetooth, accelerometer, buzzer, and touch sensors. Firmware is updated via USB using Device Firmware Upgrade (DFU) mode. We don’t don’t see any way to connect an on-chip debugger. We searched to see if there is a JTAG port on the circuit board and it sounds like getting the watch apart without breaking it is pretty tough. Now that you don’t need to stick to what Sony had planned for the device, what do you want to do with your strapless wristwatch? 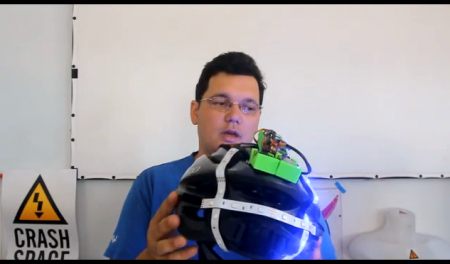 Earlier this week, I showed you [Naim Busek’s] kickstarter for his turn signal helmet. In that article I explained that, while the helmet is a neat idea, I was really interested in what [Naim] had told me about his power consumption. To put it the shortest way, he has made his arduino sleep so efficiently, it can be waiting for input longer than the battery’s optimum shelf life. After that article, [Naim] wrote in to give me the details on what he did to achieve such an efficient system. You can read his entire explanation, un altered here. The big news circulating this morning is of the Leap Motion sensor that will be hitting the market soon. They claim that their sensor is ~100 more accurate than anything else on the market right now. Check out the video to see what they mean (there’s another at the link). This is pretty impressive. You can see the accuracy as they use a stylus to write things. If you’ve played with the Kinect, you know that it is nowhere near this tight. Of course, the Kinect is scanning a massive space compared to the work area that this new sensor works in. The response time looks very impressive as well, motions seem to be perfectly in sync with the input. We’re excited to play with one when we get a chance.